This is especially useful for healing, which runs daily to ensure that all installed products and current subscriptions remain active. A service level preference can be defined when a subscription operation is being run (such as registering a system or attaching subscriptions after registration). This can be used to override a system preference. Both the register and subscribe commands have the --servicelevel option to set a preference for that action. The --servicelevel option requires the --autosubscribe option (for register) or --auto option (for subscribe). It cannot be used when attaching a specified pool or when importing a subscription. For example, if the preferred operating system version is 5.9, then 5.9 content repositories will be preferred for all installed products and attached subscriptions for the system, even as other repositories become available. 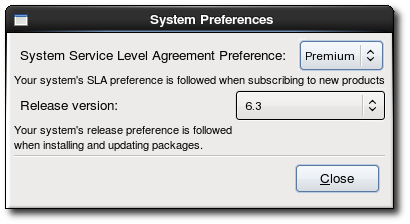 Setting a preference requires the --autosubscribe option, because it is one of the criteria used to select subscriptions to auto-attach. Unlike setting a service level preference, a release preference can only be used during registration or set as a preference. It cannot be specified with the subscribe command. 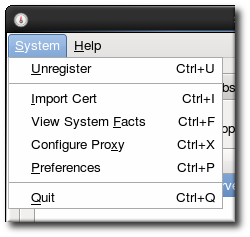 Set the service level or release version value to the blank line in the corresponding drop-down menu.